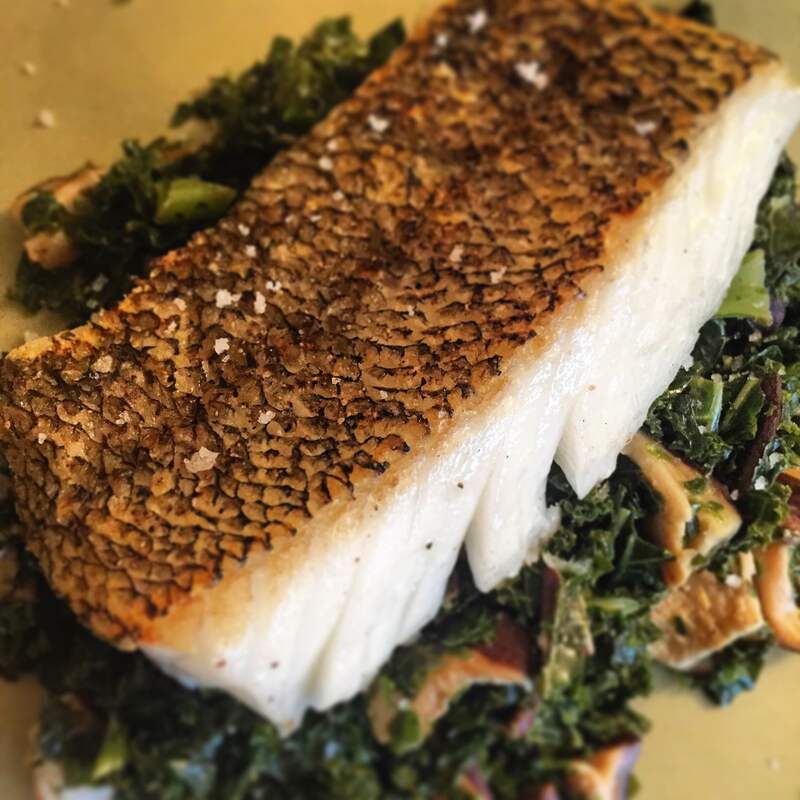 Sea bass is one of my favorite fish to cook. It is light and you can get a great crunch if you cook the skin correctly. Kale and mushrooms were a perfect accompaniment to the fish. I made this just for me, but you can obviously make this recipe as large as you’d like! 1 Portion Sea Bass – I think mine was 6-8oz. 1 Tbsp. Canola Oil – Olive oil would be better, but I was all out! 1. Heat a nonstick frying pan over medium high heat. 2. Add 1/2 tbsp. canola oil and mushrooms. 3. Cook mushrooms for about 4 minutes flipping constantly, then add salt and pepper. 4. Add kale and cook for another 5-6 minutes before adding salt and pepper. I like my kale a little al dente. 5. Add lemon juice and white balsamic vinegar and cook until it reduces all the way. 6. Remove mushrooms and kale and place on serving plate. 7. Add remaining 1/2 tbsp. canola oil to the pan. 8. Season skin side of sea bass with salt and pepper and place in pan skin side down. 9. Sear for about 3-4 minutes. 10. Season flesh side of fish with salt and pepper, turn heat to medium low and flip fish. 11. Cook fish for another 3-4 until it is a solid white color on all sides. (You may need to cover fish depending on the thickness of the fish at this point). 12. Place on top of kale and mushrooms to serve and finish with the Portuguese Salt.